John Bolton Loves The U.N.
News Item:Bolton Urges Strong Response From U.N. This entry was posted	on Wednesday, July 5th, 2006 at 3:39 pm	and is filed under Latest Comics, Main Blog (All Posts). You can follow any responses to this entry through the RSS 2.0 feed. Both comments and pings are currently closed. The only thing relevant is the amount of time its gonna take for North Korea to get that weight package right for the war head. The tapodong 2 has a range of 9300 miles. When they get the weight ratio right their ready! Them 7 missiles flying around aint the boogey man yall! Thats real sh*t. Im glad we got National Missile Defense. Will the system bankrupt us ?? I doubt it seriously! If Kim Jong Ill decides to hit Los Angelas with a nuke 5 times bigger than the one droped on Hiroshima will that bankrupt us?? Hummmphhh It would clean us out!!! My phone went off with war ringtones from hell when those missiles got launched!! Buck out!!!! 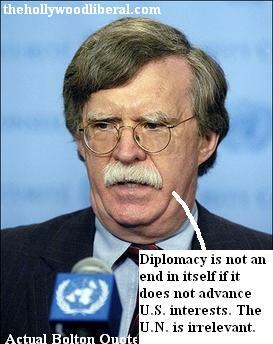 I’m glad to see that Bolton had finally decided the U.N. might be good for something after all. If we can use diplomacy instead of war to solve our problems with other countries, we will be much better off. And if Kim Jong Il and Ahmadinijad would quit telling the world they want to wipe out countries and blow up Los Angelas and Israel and orther places we would not have to. I think they should follow your lead. If only they would agree with you THEN I would agree with you. It would then be safe to. Buck out!! Someone should check under that womb broom for WMA’s…. Bubba! Brent. So my stuff is not funny. The Daily Show is funny is only funny from Time to Time, but Dennis Miller now he was funny??? Is that what you are telling me. Maybe you have no sense of humor you ever think of that? Or maybe you are a republican troll, with nothing better to do. The jokes you made about staying in the basement eating hotpockes were ABSOLUTELY HILARIOUS. You must be a professional comedian. Too bad the rest of us won’t get to enjoy your comic gems because you had to be such an Foul mouthed A**HOLE in your comments. Of course you didn’t leave an email address so I could get back to you personally, whatever dude.